Since 2004 Alba Game Fishing has delivered memorable salmon fishing holidays in Scotland. We offer day trips on all of the big four rivers. The River Spey, River Tay, River Dee and River Tweed. 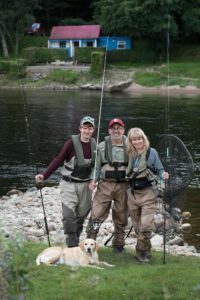 In addition, we have the knowledge and contacts to connect you with some of Scotland’s lesser known, “Hidden Gems” of Salmon fishing in the Scottish Highlands and West Coast of Scotland, such as the River Gruinard, Dionard and River Alness. If you have never tried the art of Spey casting with a double hand rod, we have several brands of Salmon Spey Rods you can try, including Hardy, Orvis, Sage, Vision, Mackenzie and Bloke Rods. We have a huge stock of quality fishing tackle. We couple these with well-balanced lines, and have Shooting heads, Skagit, and traditional Spey lines of varying head lengths. Within our team are SGAIC casting instructors and AAPGAI, salmon fishing instructors. We can maximize your enjoyment and get you casting quickly and with simply clear instruction. At the business end, the choice of salmon fly is important, and our flies are hand tied by a team of professional Scottish fly tyers. We provide Orvis lightweight pro-guide waders. These are premium quality and comfortable, we carry a stock of 30 pairs (and growing) Our boots are all of the best quality and Orvis brand. They have Vibram soles with tungsten Posi Grip studs, ensuring a sure-footed grip on the river bed and more importantly keeping you safe and comfortable. Our team can help you plan bespoke holidays which blend salmon fishing with other activities in Scotland, such as touring, golf, sightseeing, wildlife photography, visiting castles, whisky tasting and ancestry. If you are looking to fish rivers close to Outlander Film Locations we can help. We are fully insured as a tour operator and carry “Hire and Reward” Insurance for our vehicles. You should be very careful when considering a holiday of any type in Scotland with a company and always ask the question, do they have Hire and Reward Insurance? Shockingly most don’t and therefore you run the risk of not being properly covered in the event of an accident. Why do companies not all have this insurance? The answer is, it’s expensive and most companies cannot afford this and take risks. 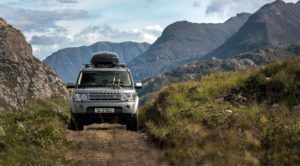 We can provide Mercedes Viano People Carriers and luxury Land Rover Discovery HSE to enjoy Scotland’s scenery and get you to the rivers in comfort and safety.